It's been an interesting week, dear reader. A very interesting week. It actually all started a couple of weeks ago. Actually, it started more than a year ago, when I initially decided Geegeez needed to upgrade its payment infrastructure to accommodate subscribers who didn't have - and didn't want - a PayPal account. What should have been a simple operation was rendered complex to a labyrinthine degree by a number of what are known in the project management industry as OSINTOT's ("Oh shoot, I never thought of that!" Occasionally, in extreme cases, there can be OFINTOT's - I'll leave you to work that one out!). Long story short, a thousand tweaks and tinkers later, and we had a system communicating correctly 'end to end', i.e. from geegeez to paypal and back again. Sadly, it was mainly communicating the 'Victory V' signal, declining users' transactions. This negative behaviour was naturally transpiring while I was sunning myself on a beach along the beautiful Pembrokeshire coast in Tenby. Many frustrated would-be Gold subscribers and one very frustrated general (Chris) later, we finally got to the bottom of the problem yesterday morning. Turns out it wasn't a technical issue at all. Go figure! Instead, PayPal's wonderful vetting department had set the business sector to 'gambling', i.e. taking bets as an operator/bookmaker. That, clearly, is not what geegeez is about, and a simple switcheroo to something more appropriate significantly reduced the risk factor associated with Gold transactions in the all-seeing eyes of PayPal. The good news is that it looks like the pain is almost over, with all buttons now behaving themselves impeccably for a whole day! The better news is that you can signup from within secure pages right here on geegeez.co.uk now, meaning you no longer need a PayPal account to get involved. This painful upgrade also has a number of other positive implications in terms of our flexibility to accommodate the way you want to sign up, but I'm confident I've bored you for long enough with this deeply frustrating saga. One thing I would like to do is apologize sincerely to those who have had problems in recent days, especially Sarah C, who jumped through umpteen hoops and tested a number of scenarios to help us troubleshoot the problems. When there are problems signing up, this is NEVER a customer's fault. If you want to join Gold and we're not making it easy for you to do, it is very much OUR fault/issue. I think, finally, we're in a position to make things a good deal easier to get involved. I blooming well hope so, anyway! On the way back from Wales - fantastic time with Gavin, his good lady, Sam, and their son, Dylan - I had a scheduled stop off at Ascot Sales. For the past few weeks, Anthony Honeyball and I had been hatching a plan to bag a high profile horse with plenty of upside. Anthony did all the legwork here, and he left no stone unturned. We'd identified the dispersal draft from West Lockinge Farm, and particularly Lot 102, a horse called Knock House. Lot 102, and a number of other horses in the draft, were thoroughly vetted, with the primary focus horse coming up pretty clean. I emailed existing geegeez.co.uk syndicate members about the concept, and received an overwhelmingly positive response. So we decided to try to land this whopper. In case you didn't know (why would you? ), Knock House is a seven-year-old gelding with just 17 starts to his name. In that relatively short career, he's won five races (a bumper, a hurdle and three chases) and placed on another five occasions. The striking element to his form profile - aside from a rating of 143 - is that he has finished fifth and fourth at the last two Cheltenham Festivals. Indeed, his run in this season's Kim Muir was almost as eye-catching as that of the winner, Cause Of Causes. Ridden ultra-patiently by Nina Carberry, Knock House was almost knocked out by a faller - suffering interference that detached him from the strung out pack. But, turning in, nothing was closing faster save the runaway winner. Knock House finished fourth, beaten five and a half lengths for second, a position he would surely have filled with a clear passage. Here's the thing though. He gives the impression he'll stay further, an impression his breeding largely supports, and he might well make up into a National type. The bidding started at £70,000, higher than any prior (or subsequent, as it turned out) lot had sold for. The to's and fro's were rapid fire and in an instant, the bluster and blarney from the auctioneer was compelling those present to bid up from £90,000. A look from Anthony, and a nod from me, and the Honeyball arm signalled £95,000. It was a quieter ring now, subdued most likely by the very high opening gambit, but there to our right was a man in a flat cap on his phone. A nod of the flat cap and a raise of a finger moved the bidding to six figures: £100,000. I don't mind admitting I was uncomfortable with what we were doing. Not because of a lack of belief in any of Anthony, the candidate syndicateers or indeed myself; but simply because this was uncharted territory. In my life, I have bought TWO houses for less! That was a thought that mercifully came to me later. In the moment, where credulity - and credit! - gets stretched, Anthony turned again to me and whispered, "Go one more?". Head said no, heart said yes. These kind of horses - good horses without debilitating battle scars and with upside potential - don't appear weekly. "Yes, go one more", I muttered back. A second lift of the Honeyball hand confirmed the bid was with us, at - gulp - £105,000. But the flat cap perched atop Donald McCain's pate (for it was the Grand National-winning trainer) - or, more specifically, his telephone sponsor - was not to be denied. £110,000 became the new high with an almost casual waft of an arm to our right. And we were cooked. Knock House was knocked down for £110,000 - a hundred and ten grand - and we were knocked out. McCain was doing his bidding for Tim Leslie, a hedge fund manager with deeper reserves than ours, and I wish them well with their new acquisition. 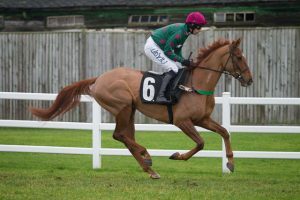 When horses that have won a point-to-point in a field, or have scrambled home in a moderate bumper, are selling for similar prices - and more - going long for a proven lad like Knock House was, as McCain himself put it, "a no-brainer". I would have been absolutely delighted to have been offering a horse of that proven quality to geegeez readers for syndication. But it wasn't to be this time. We'll keep looking for the right horse. Alas, there are very few who fit that bill - it's senseless going half-cocked at a 'nearly right' profile. Friday and Saturday of this week are given over to the third and fourth Classics of the season, the Derby and the Oaks. There is a high class supporting cast of races, and I'll be previewing most of them. Expect the Oaks day preview online this evening - the wonders of 48 hour declarations! - and Derby day will follow at roughly the same time tomorrow. In the meantime, if you missed my Oaks preview from last week, you can catch up on that here.